Front crawl – also called the freestyle or simply the free – is the fastest of the four competition strokes. Freestyle swimmers are known for their V-shaped torso – broad shoulders and narrow hips – physical proof that this stroke relies on extreme upper-body strength. However, the legs and torso still play an important role in the execution of this stroke. Freestyle is performed by using an alternating arm motion to move a swimmer through the water. As one arm moves from the hips to the head out of the water, the other arm does an S-curve pull under the water. This S-curve pull uses most of the muscles in the upper body. The first part of the S-curve – where the hand catches the water and begins the pull by executing a sculling motion – uses the forearm muscles and your latissimus dorsi. The middle portion of the S-curve pull works the biceps and deltoids, while the completion of the curve – the portion where the arm leaves the water – works the triceps. Throughout the pull, the pectoral muscles are engaged, as are the hand muscles, which must remain tight to keep the fingers together to increase the force of the pull. Freestyle swimmers use a flutter kick to propel themselves through the water. The flutter kick uses alternating movements of the feet, pressing one foot down slightly into the water while the other foot returns to the surface. This movement keeps all the major muscle groups in the lower body engaged – including the feet muscles, calf muscles, hamstrings and quads – although the bulk of the movement is generated by the hips. The movement begins with the glutes – the muscles in the buttocks – which power the motion all the way down the legs to the feet. The torso plays a key role in generating the power necessary to drive the front crawl. Although the midsection remains straight, it rotates from side to side. As it does, it generates torque, which increases the swimmer's speed. This rotating motion forces the core – specifically the abdominal and oblique muscles – to be engaged and stabilize the swimmer's body in the water. The back muscles, including the spinus erectors, are also engaged during this rotation. Improper alignment, or putting too much stress on a muscle, leads to most of the injuries related to the front crawl. Failure to keep the body straight – from the tip of the head to the tailbone – leads to injuries of the neck and lower back muscles. Keeping the toes unnaturally pointed during the flutter kick causes a condition called plantar flexion, which leads to cramps in the calves. 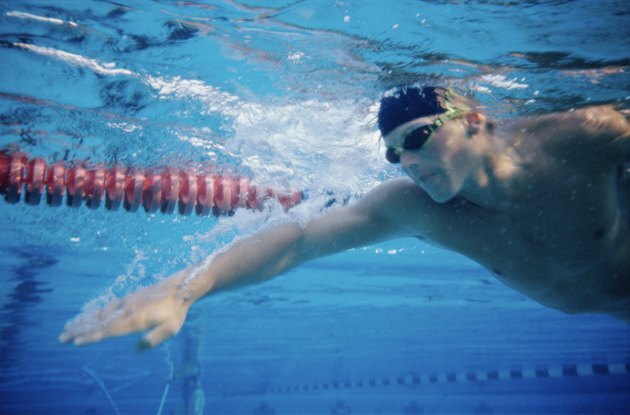 Putting too much stress on the deltoids – the shoulder muscles – by using pull buoys or arm paddles causes swimmer's shoulder, an injury characterized by fatigued muscles and overstretched or inflamed tendons.